It’s been two months since the start of the new year. There’s a good chance that the optimism and motivation and momentum you started the year with have faded. Setbacks have arisen. Unfinished to-dos have piled up. You’ve gotten out of the groove with your fledgling habits. Your mood has soured. Your morale has sagged. Your focus feels fragmented. Goals that just a month ago seemed within reach, now seem unattainable. You’ve gotten royally off track. You feel like you need a do-over. And you’re right. You need a reset day. 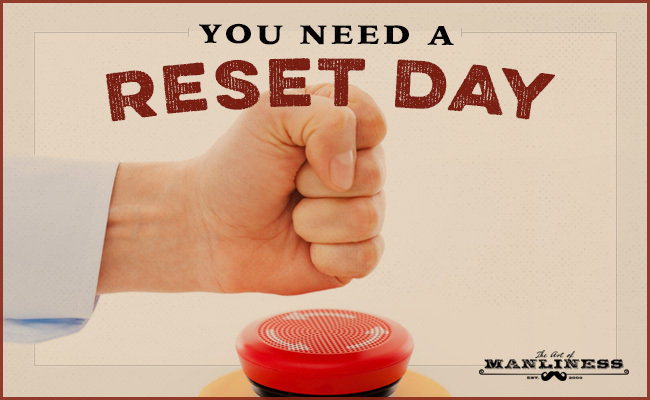 What Is a Reset Day? Despite one’s best intentions in turning over a new leaf, life happens. Forging new habits isn’t easy, while slowly moving away from them is. The best way to deal with that drift is to get re-aligned before you’ve gotten too far off track — to constantly make little course corrections as you continue towards your goal. But sometimes, one bad week leads to another, and things flat out unravel. You just get totally off track with the path you want to be on. In such a case, tinkering around the edges doesn’t work. The momentum of your off-kilter current is too strong, your schedule just too busy, to fully get back in a good headspace. You need an uninterrupted stretch, a solid block of time in which you can clear the decks – all of them. A reset day is a weekday that you take off from work, dedicated to getting your life in order. Yes, you’ll have to take a vacation day to fully implement it; more than half of Americans don’t take all their vacation days each year — you’ve probably got one to spare. It might seem like a short-term loss, but the improvements it will make to your life will create a long-term gain. Now you might be thinking, why not just do a reset on a Saturday or Sunday instead? You could, but in my experience, doing a reset day on the weekend makes it exponentially less effective. You probably have some big chores you need to take care of on those days, and if you have young kids, you’re likely shuttling them around to different activities and/or they’re up in your business. Your significant other has her own designs on your time. Also, you’ll be tackling a lot of to-do’s on your reset day, some of which may require calling a business that is closed on the weekend. A weekday reset day gives you eight dedicated, distraction-free hours, by yourself, to set your physical and metaphorical house in order — to recalibrate everything that’s gone awry. Instead of constantly putting out one fire, while another rages, you give yourself a chance to extinguish all the hot spots. You give yourself an entirely fresh start, a clean slate upon which to begin your efforts anew; it completely clears your mind of all the cobwebs formed by unfinished to-dos, burdensome distractions, and nagging questions. A reset day creates a “temporal landmark” – a date which separates a past period of time from a present/future one and has been shown to increase your motivation moving forward. I’ve found I need a reset day from time to time in my own life, and have had great success with them. Below I share what I recommend doing on your reset day. You don’t have to spend exactly one hour on each of these steps; if one takes you less time, move on to the next. But don’t spend more than an hour on any – you want to make sure you get to each “phase.” In the 7th hour, you’ll get to tie up any loose ends that remain from the previous steps. You don’t even have to rigidly follow this schedule/order; do what works for you. But I think this is a helpful outline of the kinds of things you’ll want to tackle on a reset day. Jordan B. Peterson says cleaning your room can be the first step in getting the rest of your life in order, and Naval Admiral William McRaven says making your bed can help you change the world. Your environment matters. When it’s chaotic and messy, so are your thoughts. Once you organize the place in which you stand, you’ll be in a better mindset to get everything else sorted out too. See how much you can get done in an hour, but once an hour is up, move on to the other steps. Sometimes we get off track with our goals, or at least don’t put in our full effort on them, because we have so many “open loops.” These are unfinished tasks or unanswered questions that run through our minds each day. While you’re working on a job assignment, you start thinking about whether you should get your estate planning done. When you’re playing with your kids, you’re thinking about their college fund. Ten minutes later, you’re wondering about your new workout plan. This back and forth switching between the task at hand and those yet unfinished is mentally draining. For me, I typically get off the rails when I’ve got too many of these open loops going on in my head. My mind feels hugely scattered and distracted, and instead of tackling all the things that need doing, I do nothing at all. To tame the tyranny of open loops, perform a brain dump by writing down anything and everything that’s been weighing on your mind. Think about all the areas of your life: work, gym, family, friends, church, etc., and what tasks need doing in each of them. Also jog your memory and try to write down any questions – big or small — that have been niggling at you lately, but you keep putting off figuring out; i.e., you keep intending to look up the answer, but even a google search seems like too much effort, and you end up scrolling through Instagram instead. What workout program should I do? What’s the right form for doing a squat? How do I get started with the keto diet? How much would it cost to fly to New York City? What’s a good date/destination for our next camping trip? What’s the best haircut for my face? How do I trim my nose hair? When I do my mind dump, I use this Getting Things Done Trigger List to help me think of all the open loops I’ve got lodged in my brain. For recording everything you dump, you can use pen and paper, or another medium. I personally find the todoist app to be incredibly handy for keeping track of both my business and personal tasks. See how many to-dos you can knock out in an hour. Then move on to the next step. Ahhh . . . doesn’t it feel good to close some of those loops? You can already feel weight being lifted from your psyche. Now that your mind is unburdened from those annoying little doo-dads, you’re in a much better place to review your higher-level goals. If you don’t have any big macro goals, use this hour to establish some. Check out our guide on how to create a blueprint for your life for some guidance (you won’t be able to create a whole, detailed life plan in an hour, but it’s helpful to start thinking through your roles in life, and how you’d like to improve in those roles). How is my progress on this goal? Do I still want to achieve this goal? What’s one action I can take today to put me closer to achieving this goal? What’s one habit I can begin working on today that will take me closer to my goal? One of the biggest factors in life feeling fragmented, restless, and unproductive is not having a set daily routine. I wish this wasn’t true; I wish you could just do what you wanted, when you wanted, and feel great. But for the great majority of people, if you don’t have a set routine, your life invariably feels at loose ends. You constantly lay your head down at night, feeling like you didn’t make as much of the day as you could have. So if you haven’t set a daily schedule for yourself yet, now’s the time to do it. It can be useful to schedule out every hour of the day/week. But things during your work hours rarely go as planned. So concentrate on those parts of the day you do have full control over: your mornings and evenings. “Bookend” your day by creating a morning and evening routine: Decide exactly what time you’ll wake up and go to sleep, and what you’ll do in the 1-2 hours after rising and before hitting the hay. Be specific and write down this plan! You can learn more about the power of morning and evening routines here. If you already have a routine, but it doesn’t seem to be working for you, it may be that your routine no longer meshes with your reality, and the way your schedule and responsibilities have shifted over time. Despite these changes, you keep trying to fit your old routine into your new life, and that’s a recipe for frustration. In this case, use your reset day to adjust your routines so they better fit your new schedule. Maybe you’re no longer able to do your ultimate, super productive morning routine anymore that consisted of meditating, journal writing, exercising, planning, and reading. No big deal. Decide which of those tasks are the very most important to you, eliminate the ones that aren’t as important, and make that your new routine. Maybe you just work out in the morning and plan at night. It’s better to have a routine you can stick to than a routine that just makes you feel terrible about yourself. Even in pared down form, you’re still getting important stuff done. A very occasional reset day is sometimes necessary, but you don’t want to make them a habit. You may have one vacation day to spare, but you probably don’t want to part with a week of them! To minimize the chance of needing another reset day (at least anytime soon), make plans for how to avoid getting off track again. Do some introspection. What were the main things that caused you to go off the rails? Your constantly messy house? Your web surfing habits? Not having a set to-do list or a routine – or just not using them? Whatever factors are at the heart of the problem, spend some time creating an action plan to address them. If your problem was not having a routine or to-do list, hopefully you’ve already solved those issues in the previous steps. If you spend so much time looking at your phone that you can’t get anything else done, “declutter” your digital life and download some apps that will curb your goal-sabotaging surfing habit. If there is anything important you left undone in the above phases in order to move on to the next step, now’s your chance to tie up those loose ends. After spending a day getting stuff done, treat yourself to something relaxing that will help your mind and/or body recover. Take a nap, get a massage, sit in a sauna, take a bath, go for a hike. Find something that feels good and do it. It will really recharge your batteries. I know it can be hard to justify this kind of “indulgence,” but think of it as “sharpening the saw” — a pause that will allow you to cut through your goals much more effectively once you resume their pursuit. With your physical and metaphorical house is in order, you’re ready to take on the world. The decks are clear. An effective foundation has been set. Use the momentum you built up during your reset day to crush goals and slay dragons. You got this.